This is the BEST EVER BROWNIE FROSTING and I am not messing around. Rich and fudge like this frosting it is mouthwateringly delicious! Get yourself ready to lick the bowl clean. My dad made this Best Brownie Frosting recipe as long as I can remember. I seriously have never had a brownie that was better than my dads. When I got into college, a time in my life where brownies were made weekly I decided it was time for me to learn my dad’s ways. I hadn’t asked before then because I was intimidated making anything from scratch. When I called and asked my dad for the frosting recipe he was excited that I wanted to make them. When he told me the frosting was made in the microwave I was even more excited because then I knew I had less of a chance of messing it up. I continued by asking him for his brownie recipe, and that is when I was given shocking news. My dad used a brownie mix! WHAT??? Honestly, I was shocked, how could this be? Why, why on earth did I think they were homemade? Because they were my dad’s brownies. He said he always just used Ghiradelli brownie mixes and then made homemade frosting to give it that homemade taste. Well, it is the frosting that makes it oh, so amazing! His brownies to me are still the bomb and can’t be beaten. Since then I have used Ghiradelli brownie mixes and just like my dad’s brownie frosting, my Fudge Brownie No-Bake Cheesecake can’t be beaten. I have continued to make my dad’s brownies throughout the year. And everyone loves this BEST EVER BROWNIE FROSTING. So while I would top a chocolatey brownie with anything else, you could add sprinkles on top of this chocolate frosting, my girls sure love them this way. How do I make icing for brownies? You can make several variations of frosting for brownies, I love this recipe for BEST EVER BROWNIE FROSTING especially with the ease of the recipe. You could also use a nice buttercream frosting or another fun topping is chocolate whipped cream. How do you make chocolate frosting? Depending on which frosting recipe you choose, it may require a hand mixer, microwave or stove topping cooking, whisk and proper measure tools. See below for recommendations. I had to know where my dad got this recipe for brownie frosting, I mean he is a fantastic cook but he has never just made up a dessert recipe, he does make a lot of savory dishes but sweet ones he always has a recipe. I was not surprised at all when he said he got the recipe from Jean, one of our longtime family friends. Jean really does have some of the best dessert recipes. I am completely obsessed with her recipe for Pumpkin Bars. Don’t forget to pin this recipe for BROWNIE FROSTING to your favorite Pinterest board for later. This is the BEST EVER BROWNIE FROSTING and I am not messing around. Rich and fudge like this frosting is mouthwatering delicious! 3 3/4 cups powdered sugar also equals 1 lb. In a medium glass mixing bowl add butter and cover with a plate and heat butter for 1 minute in the microwave. Remove from microwave and remove lid. Stir in vanilla and buttermilk, place back in the microwave and heat for 30 seconds, stir, then heat for another 30 seconds, stir, heat for 30 seconds and stir and then heat for another 30 seconds. 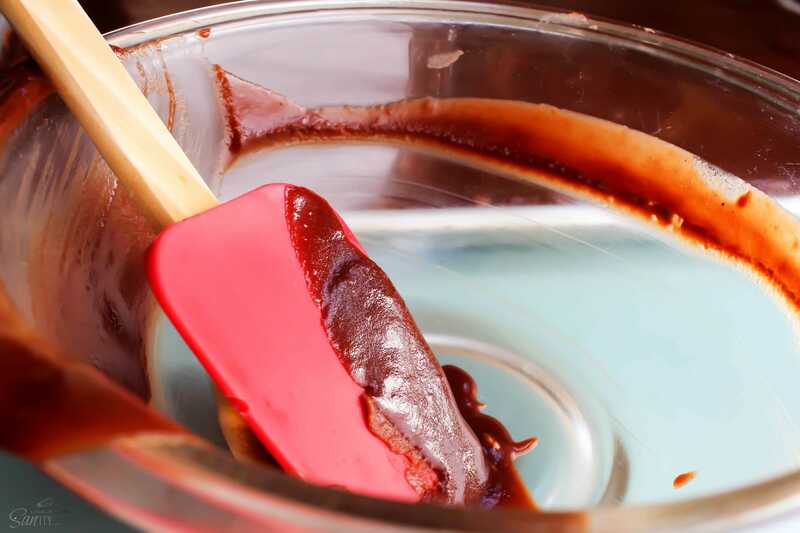 Remove from microwave and stir in cocoa and powder sugar, until well combined. Place back in the microwave and heat for 30 seconds, stir. Heat for another 30 seconds and stir, repeat 1more time if needed, until frosting is smooth and there are no clumps. Pour over brownies, and spread evenly. Let frosting cool and harden. This post has recently been updated from it’s original posting date of Sept 2015. How much powdered sugar do you add? I looked for the amount listed but couldn’t find it. Look at the list of ingred. What about the list of ingredients? I checked on Amazon & they don’t carry the: Poudre River Cook Book. I can send you a copy if you would like. These look great! How much powdered sugar? I have made the frosting but didn’t see the amount of powder sugar that way needed. Your brownie frosting is just what I have been looking for….it looks wonderful! I would like to make this but recipe doesn’t say how much powdered sugar. How much powdered sugar do you use? This was left out of the ingredient list. how much powdered sugar in the brownie frosting? Can’t find measurement in ingredients. Love how fudgy the frosting looks! 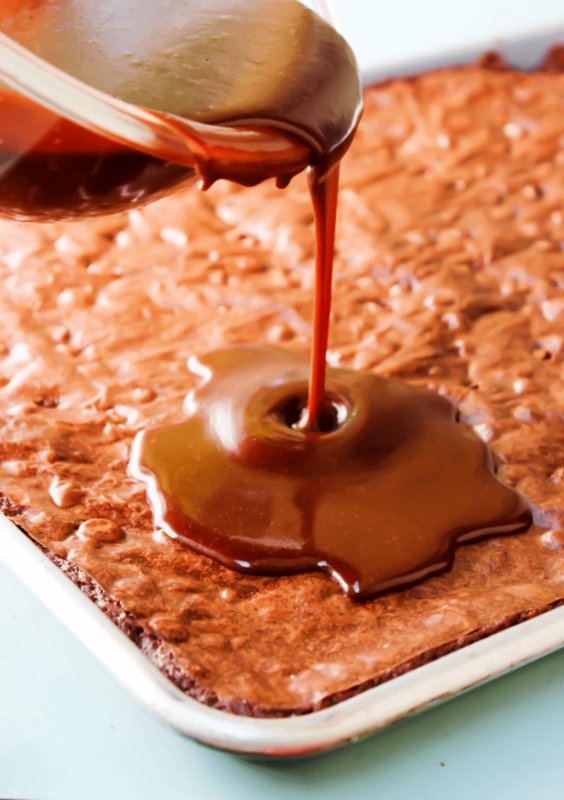 The perfect topping for brownies! How much powdered sugar is needed for this deliciousness? I was in the middle of making this recipe when I realized that the ingredients list does not include how much powdered sugar. ARGH!!!!! I poured, and poured, and poured about 2.5 cups and wsa not sure how thick it should have been so i stopped adding it for fear of it being too sweet. It is in the refrigerator now to get hard quicker – I hope it tastes okay. It is needed tonight for a fund raiser! Hi! How much powdered sugar, please? Sounds amazing! How much powder sugar do you use? It seems to be missing from the ingredients list. I would love to know how much powdered sugar you use for this frosting. I don’t see powdered sugar listed in the ingredients. How much do you use? Thank it for sharing the recipe! I didn’t have buttermilk so I used whole milk and it turned out great! We made brownies for my son’s party happening later today. We topped a pan of brownies with your frosting and sprinkled M&M minis on top. He is so excited!! I would be licking the bowl clean. Great Recipe! Thank you for sharing it. I do have some concerns about the people who couldn’t see the powder sugar amount on the list of ingredients clearly stated ABOVE the direction list and BELOW the prep times. It’s amazing you didn’t pull your hair out on how many people did not pay attention & kept asking the same questions. I worry/question these same people using a microwave to make this recipe or getting behind the wheel of a vehicle and going somewhere! I thought your ingredients list and directions were very to the point. Thank you again for sharing. Thank you Lottie – you made my day! LOL… I imagine that when the recipe was first printed, the amt of powdered sugar was omitted? I thought the same thing Lottie! Kelly – powdered sugar mostly anywhere. Where do you live and I can send you link? Also, I have never used anything but buttermilk, so I can say how it would turn out. But with that being said, sounds like some have had success with whole milk. I love buttermilk and the flavor it adds so I encourage it. Enjoy! Does this recipe make enough to frost a sheet pan (18x13x1-1/2″) of brownies or should I double it? The recipe will be enough for you pan size. It is the pan size I use as well. Does the frosting sort of harden so you can stack the brownies in a tin? Made this for the first time this evening. I did not have buttermilk, but made my own by mixing milk and lemon juice (1 cup milk & 1 T lemon juice, set for 10 min) and measured amount needed. The icing poured so easily, but I had to spread and work quickly to cover my large double batch brownie pan before it set. All in all it looked really impressive! Better yet, it tasted delicious! My four teens loved it and their friends sang it’s praises. My husband loved it too! The icing really makes a simple box brownie seem like a professional treat. Thank you. Hi, I may have missed it but how many boxes of brownie mix do you make for that size pan? And would you put the toppings on immediately after or would you let it sit for a while? Also do you put it on hot brownies or cooled? Follow the instructions on the box for the pan size. 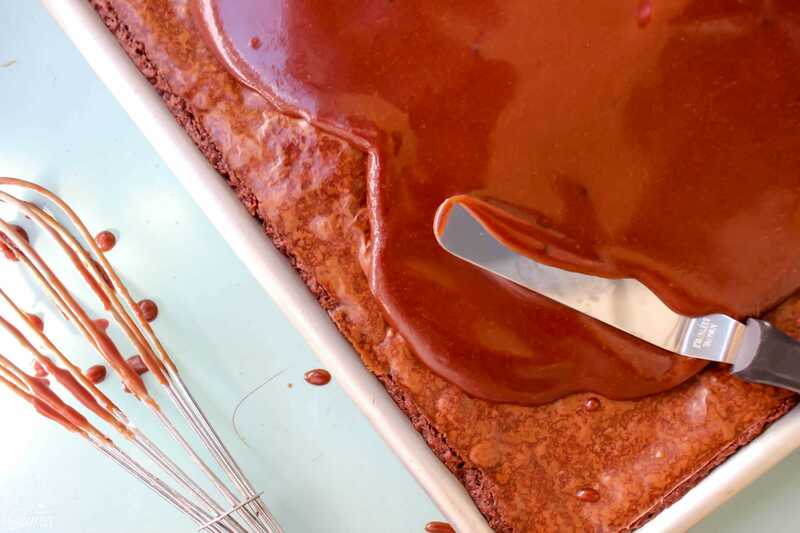 Smaller pans will make thicker brownies, and a 9×13 pan will make thinner ones. I would let it cool while making the frosting, otherwise it may take longer to set the frosting. This will be perfect for my next brownies, thank you so much! 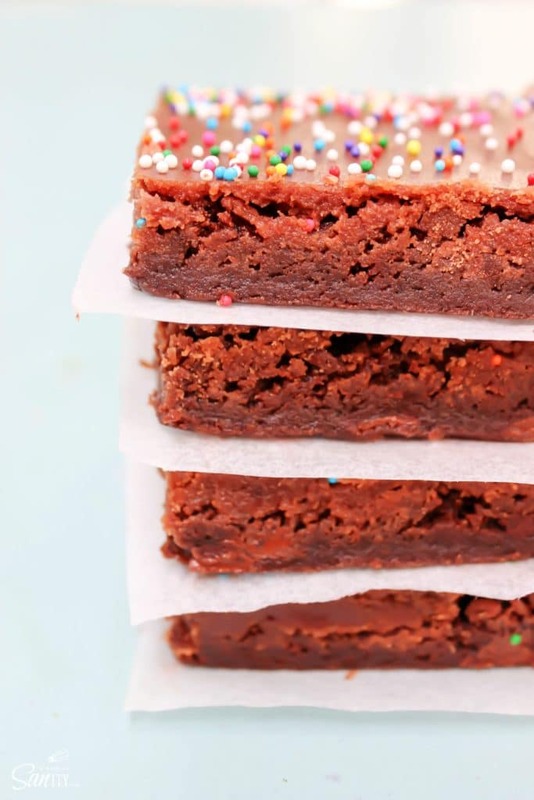 Frosting for a brownie is such a genius idea! Your Dad is brilliant! Brownies are my favorite. This icing sounds so good I might just make a bowl of it! Definitely a good idea! Thank you! This brownie frosting looks so delicious! Love that it is made in the microwave. 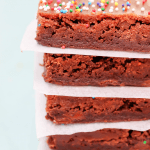 So easy and the perfect way to dress up a box brownie mix! 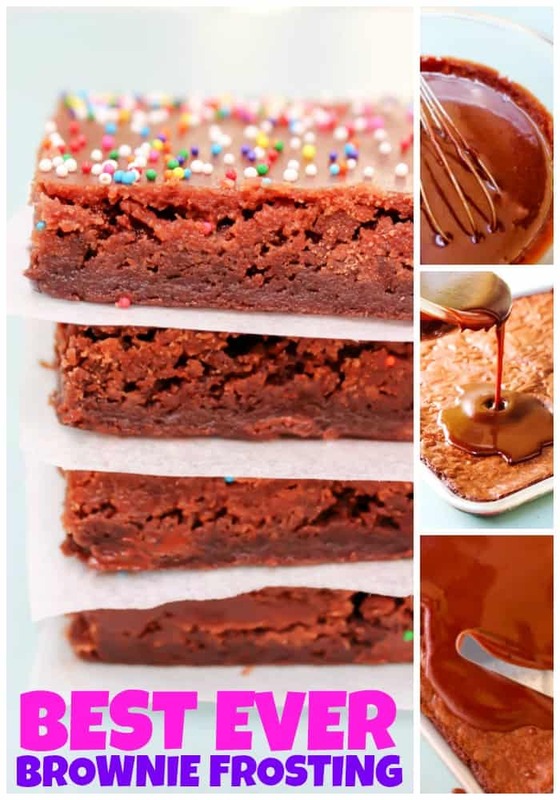 What a great brownie recipe! Calling my name for sure! I love the texture of these frosting! So perfect! Best Brownies ever! I have been cooking and baking for over 50 years. My friends and family say I am a very good cook. But these are the best and easiest brownies I’ve made. Thanks for sharing the recipe. Turned out just perfect. and I did’t have to use a mixer! 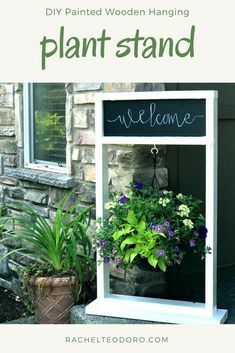 I am so glad you like them and that they turned out well for you! Thank you!